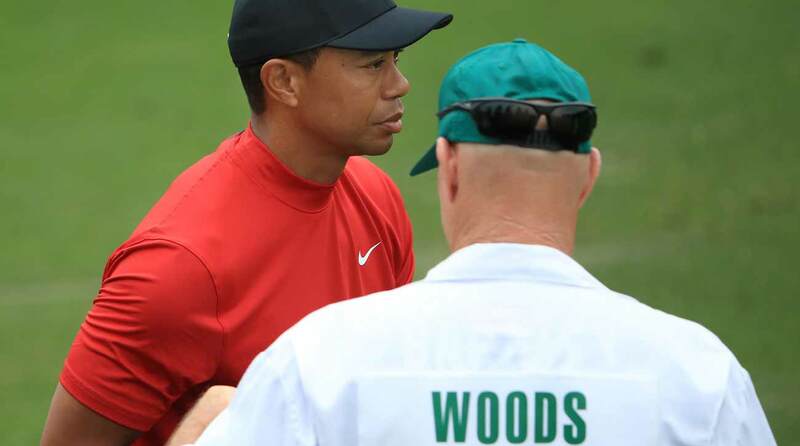 AUGUSTA, Ga. — The number peeked out from beneath Tiger Woods’ caddie Joe LaCava’s white Masters jumpsuit: 26. The name above it? “BARKLEY.” So why, on a massive Masters Sunday with his player in contention, was Joe LaCava rocking a New York Giants jersey? The short answer is that LaCava is and always has been a massive New York sports fan. He lives in Newtown, Conn. — not far from the New York border — and frequently reps his favorite sports teams on the course. LaCava is a big fan of the New York Rangers and New York Giants and frequently flashes their logos beneath his caddie bib. Tiger Woods' caddie Joe LaCava was rocking a Saquon Barkley Giants jersey on Sunday. LaCava changed things up on Masters Thursday from his normal blue-and-red pro sports team ensemble, however: He rocked a t-shirt repping the Endicott Gulls, a Division III college in Massachusetts where his daughter attends school. But on Sunday, he went back to ole reliable: Saquon Barkley and the New York Giants. LaCava has been on Woods’ bag since 2011 after splitting with Steve Williams. LaCava had worked for Dustin Johnson, but was better known as Fred Couples’ caddie; the two were partners for 20 years. LaCava has emphasized his loyalty to Woods. During Woods’ injury layoff, he told LaCava he could go find another bag, at least until Woods returned. “He said, ‘No, no, I’m committed to you. I’m committed to your return and you playing golf again,'” Woods told Geno Auriemma last year. LaCava isn’t the only Woods caddie to express himself with a t-shirt on the grandest stage in golf. 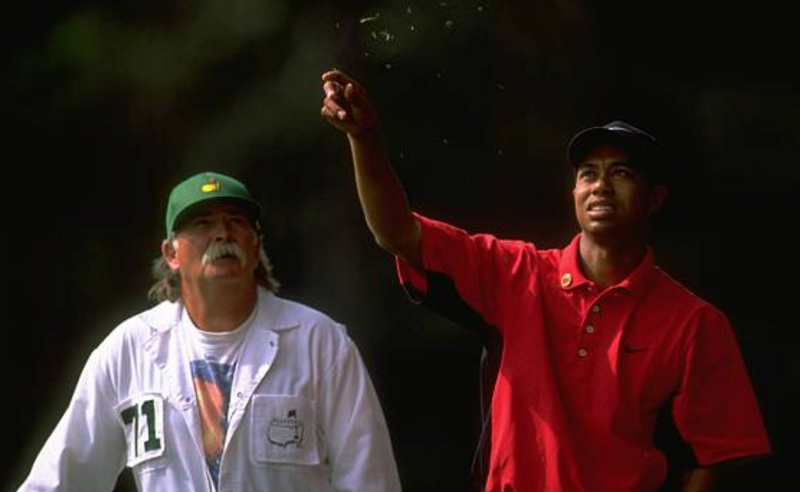 While toting Woods’ bag at the 1997 Masters, Mike “Fluff” Cowan wore a t under his overalls emblazoned with the image of Grateful Dead frontman Jerry Garcia.